The extraordinary diversity of forms and life strategies of copepods makes them very convenient subject for studies of variety of fundamental biological processes. They play a significant role in every ecosystem. As the dominant secondary producers, copepods are like the linchpin of aquatic food-webs. Also, they are sensitive indicators of local and global climate change. 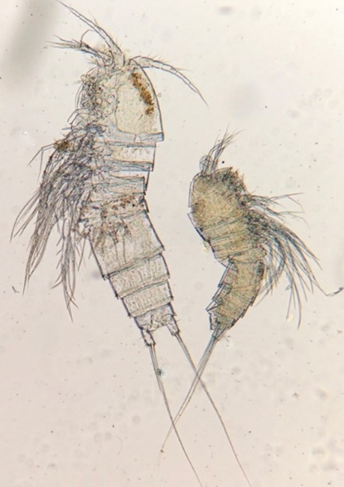 Copepods show a complex pattern of responses to variability in environmental conditions. Their abundance within a locality appears to be correlated with temporal and spatial conditions, especially food availability. Thus, they are present in various water bodies at a certain time of the year, when conditions are most favorable for them. The rest of the time, they are lying in cysts, a special resting stage, at the bottom. My PhD thesis focuses on the morphological and genetic diversity of Harpacticoida (Copepoda, Crustacea). Harpacticoids are small copepods (1-2mm) which inhabit every water body in the world from hot springs and leaf base to deep seas and oceans. It is well known that almost all morphological structures, life-strategy and breeding system of harpacticoid copepods change within a certain range in connection with variations of geographical and environmental factors. When gene flow among populations is restricted, natural selection can result in adaptation to local environments. A good example of this is the unique Canthocamptus staphylinus population discovered in Lake Pääjärvi in 1979. The population changed its sexual way of breeding into parthenogenesis probably due to limited food availability and short growing season. This fact served as the starting point for my investigation of harpacticoids intrapopulation diversity. I wanted to study how populations of several species of harpacticoids differ from each other and how their isolation can affect their morphology and genetics – I wanted to understand microevolutional processes which happen in populations of this crustaceans in different water bodies. During several weeks at Lammi Biological Station I was sampled hydrobiological material and looked for harpacticoid species, especially C. staphylinus, whose breeding transition was described by Jouko Sarvala (whom I had a pleasure to meet at the Station) in his paper “A Parthenogenetic life cycle in a population of Canthocamptus staphylinus (Copepoda, Harpacticoida)” (1979). Populations of C. staphylinus sampled in Russia, Estonia, Finland, Sweden, Norway and Switzerland showed differences in morphology of body structures and characteristics. Based on the surveys of all the varying morphological characteristics, seven morphometrical indices of the length ratios were calculated. Only four indices out of seven were statistically valid for different populations. For example, population from the Komi Republic (Russia) — the northernmost point in this study — showed the smallest body and ratios of caudal rami and legs lengths in relation to other population (see picture below). Our genetic studies revealed a high level of intraspecific genetic variability of C. staphylinus. Nucleotide sequences of CO1 gene mtDNA have divided into separate clades with the divergence of about 25%. Remarkable is that the clade from Pääjärvi showed the smallest numbers of haplotype and nucleotide diversity, thus revealing a homogeneous genetic structure of population consistent with the concept of transition to parthenogenesis. Furthermore, the high level of morphological and genetic variability of harpacticoids raised the question of taxonomic structure and existence of cryptic and sibling species. Having sequenced a more conservative nuclear gene (18S rDNA), we found out this was not a complex of sibling subspecies but still one species because divergence between populations tended to zero. Thus, it is a unique case of morphological and genetic diversity (in mitochondrial DNA) within harpacticoid species which could result from a high level of plasticity and high adaptive possibilities of this taxon. The research revealed some cases of intraspecific and intrapopulational morphological and genetic variability of harpacticoids. This is just a small step, but it could be important as a contribution to the wide investigation of copepods phylogenetic and populational structure and response to environment. Now I investigate variability of another harpacticoid species: Attheyella crassa and Paracamptus schmeili and I am excited to continue this study. Many many thanks to Lammi Biostation staff for help and kind support.